Quality Control Labels- Campbell International Specialist Tapes. Colour/Symbol: CALIBRATED - Green and white. Technical Specification: Labels manufactured from high quality paper with a permanent adhesive. Labels are supplied on a paper backing for easy removal. Dimensions: 51 x 25mm each label. Quantity: 1000 labels/reel. Available with a permanent ..
Colour/Symbol: HOLD - Yellow and white. Technical Specification: Labels manufactured from high quality paper with a removable adhesive. Labels are supplied on a paper backing for easy removal. Dimensions: 51 x 25mm each label. Quantity: 2000 labels/reel. Available with a permanent ..
Colour/Symbol: INSPECTED - Black and white. Technical Specification: Labels manufactured from high quality paper with a permanent adhesive. Labels are supplied on a paper backing for easy removal. Dimensions: 51 x 25mm each label. Quantity: 1000 labels/reel. Available with a permanent o..
Colour/Symbol: PASS - Green and white. Technical Specification: Labels manufactured from high-quality paper with a removable adhesive. Labels are supplied on a paper backing for easy removal. Dimensions: 51 x 25mm each label. Quantity: 1000 labels/reel. Available with a permanent o..
Colour/Symbol: QC HOLD - Black on yellow. Technical Specification: Labels manufactured from high quality paper with a permanent adhesive. Labels are supplied on a paper backing for easy removal. Dimensions: 89 x 63mm each label. Quantity: 500 labels/reel. 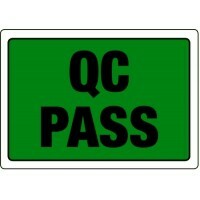 Available with a permanent or r..
Colour/Symbol: QC PASS - Black on green.Adhesive: Permanent. Technical Specification: Labels manufactured from high quality paper with a permanent adhesive. Labels are supplied on a paper backing for easy removal. Dimensions: 89 x 63mm each label. Quantity: 500 labels/reel. Available with a .. This product is made to order and has a minimum order quantity of 10 rolls and a delivery time of 3-4 weeks.For our standard permanent adhesive QC Pass Labels, please click here.Colour/Symbol: QC PASS - Black on green.Adhesive: Removable Adhesive. Technical Specification: Labels manufactured f..
Colour/Symbol: QC REJECT - Black on red. Technical Specification: Labels manufactured from high quality paper with a permanent adhesive. Labels are supplied on a paper backing for easy removal. Dimensions: 89 x 63mm each label. Quantity: 500 labels/reel. Available with a permanent or re..
Colour/Symbol: REJECT - Red and white. Technical Specification: Labels manufactured from high quality paper with a permanent adhesive. Labels are supplied on a paper backing for easy removal. Dimensions: 51 x 25mm each label. Quantity: 1000 labels/reel. Available with a permanent or rem..
Colour/Symbol: REWORK - Purple and white. Technical Specification: Labels manufactured from high quality paper with a permanent adhesive. Labels are supplied on a paper backing for easy removal. Dimensions: 51 x 25mm each label. Quantity: 1000 labels/reel. Available with a permanent or ..